COLOGNE, Germany—At Germany’s aerospace agency, the next frontier is capturing the sun here on Earth and keeping it on tap. In a 4-year-old glass and steel building near the Cologne-Bonn Airport, researchers at the German Aerospace Center (DLR), Germany’s equivalent of NASA, are working on new ways to produce more heat than light in order to smooth over intermittency, one of the biggest drawbacks of solar power on the grid. “The focus of this organization is to test ideas as close to production as possible,” said Christos Agrafiotis, a researcher in solar chemical engineering at DLR. With global solar capacity surging over 200 gigawatts, solar energy is maturing into its technological adolescence. However, it has to start pulling its own weight on the grid instead of relying on elder power sources to bail it out on cloudy days and to step in once the sun sets. Storing solar energy is one way to make power from the sun a productive member of the grid, especially as utilities work to accommodate photovoltaic panels distributed across rooftops (ClimateWire, Jan. 20). But battery technology isn’t up to the job just yet in terms of cost and performance to shift solar power across all hours. To keep the electrons flowing even when the sun isn’t shining, many researchers are increasingly looking for better ways to capture and store thermal energy, in concentrating solar plants as well as independent storage systems on the grid. Concentrating solar plants do have a higher levelized cost of energy compared with photovoltaics, said Thomas Bauer, team leader for thermal process technology at DLR, over the din of compressors in a fabrication shop. A thermal storage system coupled to a solar plant would make it easier to compete head to head with coal- and natural-gas-fired generators. It would also relieve intermittency anxiety for utilities who have to ramp up generation on cloudy days and sometimes sell electricity at negative prices on especially sunny and windy days. Bauer noted that in some power markets, the value of having power on tap is underrated next to overall power capacity, a problem that requires a policy fix. 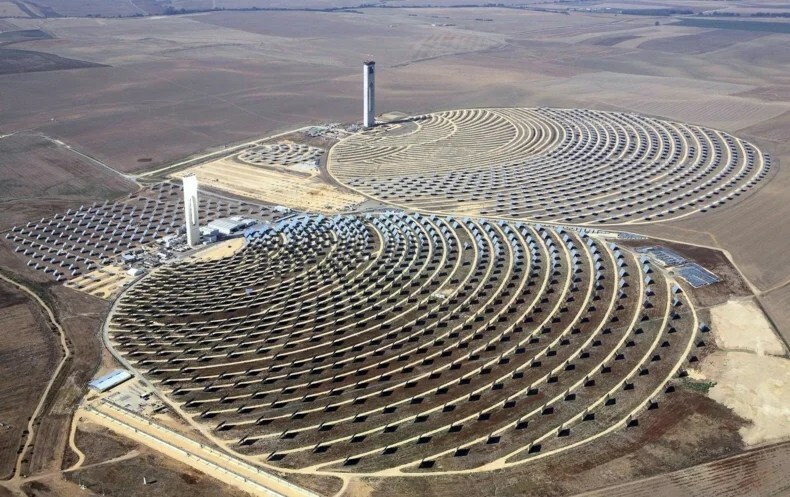 DLR developed some of the technology behind the world’s first commercial concentrating solar thermal tower plant, the 11-megawatt PS10 plant near sunny Seville, Spain, which went online in 2007. Plants like PS10 use mirrors to concentrate sunlight on a central tower to generate intense heat. Those high temperatures can produce steam to spin a turbine or warm up a material that can hang on to the heat until it’s needed. Such materials include molten salt. Solar thermal plants like the 110-MW Crescent Dunes facility in Nevada hold the molten salt in giant insulated tanks to dispatch power as needed (Greenwire, March 29). Excess energy from photovoltaics and wind turbines could also be converted to and stored as heat, offering a lower-cost alternative to batteries on the grid. “Battery prices are more than an order of magnitude, more than a factor of 10, higher than heat storage,” Bauer said. To this end, researchers are experimenting with new thermal storage materials that can get hotter, more than 1,000 degrees Celsius, and hold on to the heat for longer. Researchers at DLR are experimenting with new salt mixtures and have constructed a test facility to observe their performance along with also validating associated components like valves, sensors and storage tanks. The laboratory work would help reduce the sticker price of solar thermal power plants, Bauer said. Another approach is to use ceramic materials, which can handle higher temperatures than metals and have been used for more than 100 years in the steel and glass manufacturing sector to store heat for 15- to 30-minute intervals. Researchers at DLR are working to make ceramics more durable and store heat for longer. In some functional ceramics, the material undergoes a chemical change when heated and releases the heat when the reverse reaction is triggered, explained Stefan Reh, associate head of the Institute of Materials Research at DLR. “You use the oxide as a thermochemical storage mechanism,” he said. To make ordinarily brittle ceramics durable enough to withstand the rigors of a power plant, scientists are reinforcing them with fibers to make them damage tolerant. The aluminum oxide fibers are drawn off a spool through a slurry of water and alumina powder. After weaving the fibers into the desired shape, researchers dry the product and heat it in a kiln. The result is a light, tough, heat-tolerant material. With a sharp, loud hammer strike, Reh demonstrated that a white coaster-sized sheet of fiber-reinforced ceramic would deform, but not break. Once the heat is saved up, engineers can use it for many purposes, not just boiling water. Agrafiotis noted that high-grade heat is an important resource in many industries as it is used to treat materials and trigger chemical reactions that couldn’t occur at lower temperatures. “Essentially what we’re going to do is to use high-temperature heat from the sun to perform endothermic chemical reactions that are difficult to be performed under normal conditions,” he said, standing next to a laminar flow hood where a white, tubular infrared heater exuded an orange glow as it warmed up to 1,300 C.
These reactions include splitting water into hydrogen and oxygen, and breaking carbon dioxide into carbon monoxide and oxygen. “If you can achieve this, you can then combine CO [carbon monoxide] and hydrogen to produce syngas,” Agrafiotis said. Syngas, or synthesis gas, is a starting material to make synthetic fuels like methane and gasoline. Solar thermal power plants still have to grow up a bit further to drop in price and increase in competitiveness, but they have immense potential. “This technology is better suited for large-scale applications,” Agrafiotis said.